Reasons for concern: This aggressive plant can quickly take over both disturbed and unattended areas, outcompeting native species, reducing native plant diversity and wildlife habitat, and forming huge monocultures. 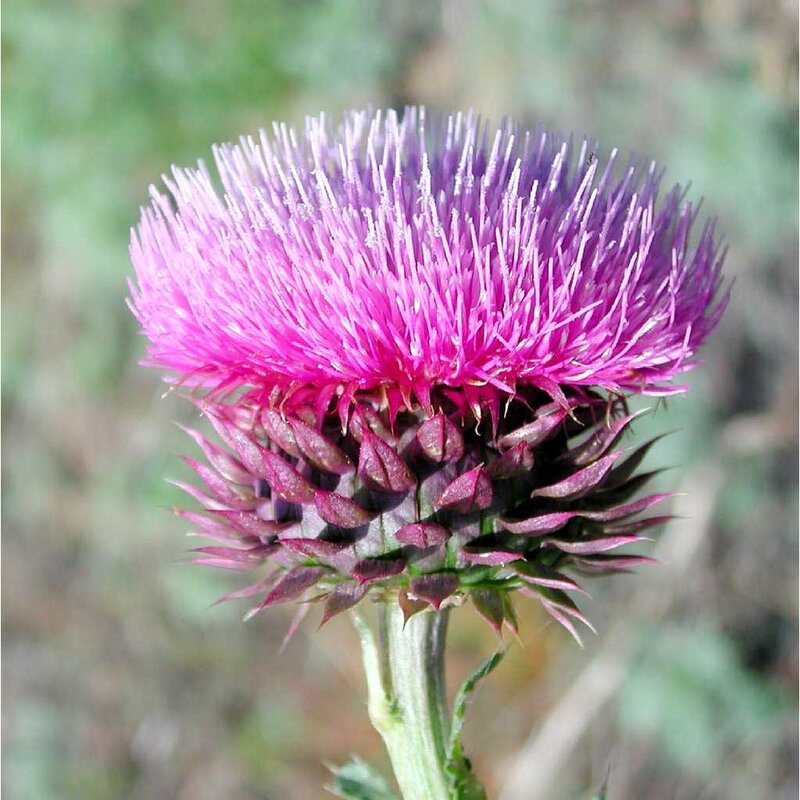 Some studies show that this thistle may have allelopathic (toxic) properties which prevent the growth of nearby plants. They are very difficult to eradicate. Botanical description: Tall, sturdy, spiny plant with many branching stems. Leaves: Rosette leaves lance-shaped to oval, dark green with spiny edges that are silvery white to purplish, with spiny margins. Stem leaves dark green with light green midribs, alternate. Spiny wings from leaves extend down stem. Rosette and stem leaves coarsely lobed, usually 1 to 12 inches long and up to 8 inches wide. Upper leaves smaller. Stem(s): Stem has very spiny wings extending from leaves down stem. Stem stout, erect; covered with cobwebby hairs, matted hairs, or almost smooth. Many spreading branches. Stems up to 1 ½ to 6 feet or more. Flowers: Red-purple. Heads are single, at end of stem, solitary, and usually nodding. Flower heads supported by modified leaves called bracts, which are smooth, reddish-purple, pointed and sharp at tip. Outermost bracts bent backwards near middle. Blooms June through September. Seeds: Seed heads topped by plume of feathery white hairs. One plant can produce 10,000 to 100,000 seeds. Mature 7 to 60 days after flowering. Roots: Taproots long, thick, fleshy, occasionally branched, and capable of penetrating soil to depths of 16 inches or more. Where it grows: Fields, meadows, pastures, wastelands, roadsides. Generally likes sun and moist areas. From 4,000 to 8,500 feet. 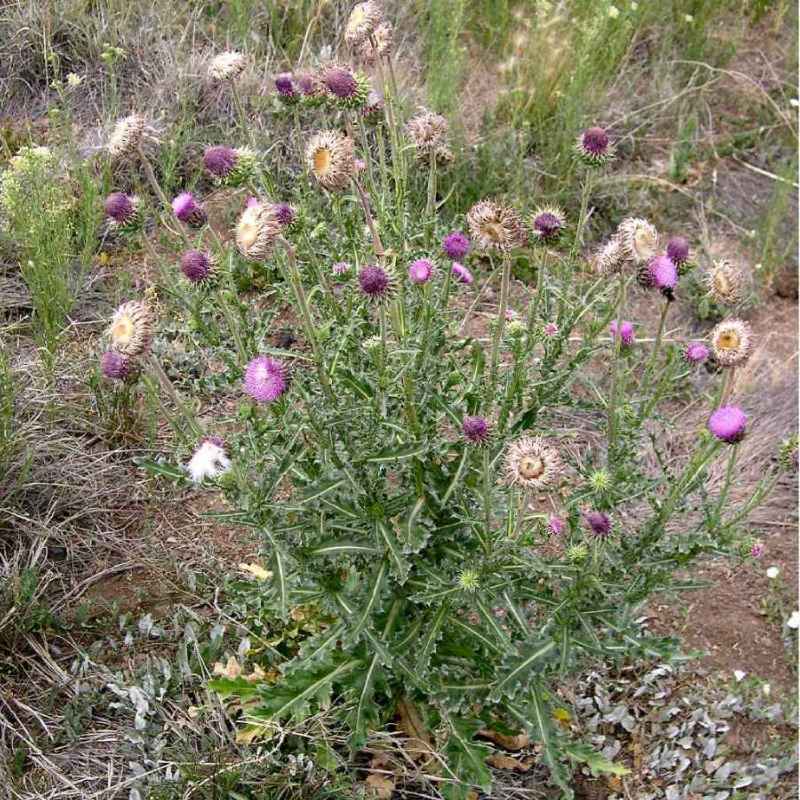 Reproduction: By seed Weedy characteristics: Musk thistle is highly competitive and aggressive, and forms dense colonies, choking out native vegetation important to wildlife. Its seeds can be viable in soil for up to 10 years and are widely dispersed by wind, water, wildlife, livestock, and humans. 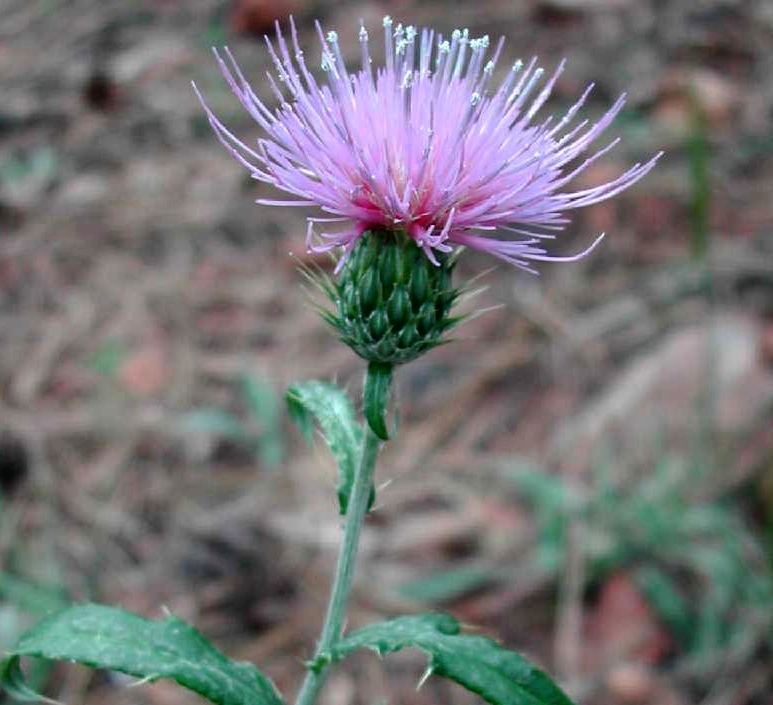 Look-alike native plants: Wheeler’s thistle (Cirsium wheeleri) with purple looks similar to Musk thistle. These native thistles are shorter and smaller than Musk thistle with more delicate stems and rosettes. The stems of the native species do not have spiny wings and therefore can be easily touched. Control strategies: Tilling, hoeing or hand pulling that severs the root below the soil surface is recommended. Do this after bolting but before flowering and seed production. Remove rosettes during their first year. Before flowering in their second year of growth, cut plant 2 to 3 inches below surface of soil. Wear gloves when handling. Do not let plant go to seed or flower. If they do, cut them off and bag all buds, flowers and seeds. Be careful not to cut them off too early because flowers can re-grow. Repeatedly monitor previous infestations for new growth. Mowing is not effective. Plant desirable native species to outcompete invasives. Chemical control may be required. Contact your local county extension office for more information on chemical control.